As the city’s first snowfall fluttered to the ground and holiday music filtered through outdoor speakers, the Boston Ballet’s Pop Up Shop opened its doors for the first time at Assembly Row shopping center on Saturday. The storefront revealed its ballet-themed window display at the end of November to coincide with this year’s first performances of “The Nutcracker.” However, it wasn’t until this weekend that guests were welcomed inside during the one-day-only event to browse ornaments, apparel, dolls and, of course, nutcrackers. “[‘The Nutcracker’ is] kind of a big city tradition. It is the most popular production that we put on. It’s one of those things that just puts everybody in the holiday spirit and we just thought we’d bring a little bit of that over to Somerville,” assistant shop manager Regine Vital said. Vital first saw “The Nutcracker” six years ago, describing herself as “an older kid, but still a kid.” She said that she fell in love with the festive atmosphere and soon joined the retail team at the Boston Ballet. Although her work schedule is constantly busy during the holiday season, she said seeing new people experiencing the ballet for the first time makes it worthwhile. “The kids come and they’re dressed up and excited and I’m always happy. I think it’s really special,” Vital said. 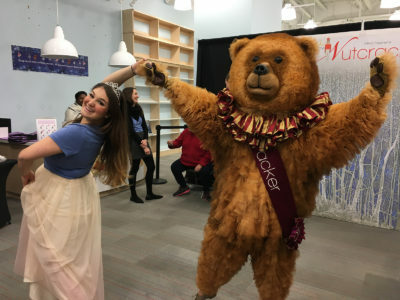 The happiness and holiday cheer that the pop-up shop brought to the community members of Somerville spoke directly to the Boston Ballet’s goal of spreading joy, explained Alyssa Galindo, marketing intern and senior at Emerson College. She helped organize the pop-up shop, create the window display and manage other ballet-related events. “This is definitely not something that was just one person’s doing. We all really worked hard to get this done, so it’s nice to see that be successful,” Galindo said. She explained that while pop-up shops can sometimes be difficult, she was pleasantly surprised with the success they’d had. As she greeted shoppers in her pink ballerina-inspired skirt, Boston Ballet shirt and sparkly tiara, Galindo said she noticed children walking in with the same happy expressions they often wore when entering the actual ballet. “I love doing things like this, just to be able to see what you’re contributing to brings a smile to a kid’s face,” she said. Kate Davis, 37, of Lexington, and her daughter Lucy, 6, were just two of the patrons Galindo spoke to. The two came to the pop-up shop mainly to meet the teddy bear, an experience which Lucy called “magical.” She said the bear was her favorite character in the ballet, which she loves because she is also a dancer. Lucy wasn’t the only fan of the dancing bear, nor was she the only child wearing a paper crown gifted to her from employees. “Everybody’s been really happy and festive and excited to get their pictures with the bear. The ornaments have been flying off the shelf,” Nicole Leckie, the retail manager for Boston Ballet, said. Leckie was the primary decision-maker in the pop-up shop event, and decided on the store in Assembly Row after a successful partnership with the nearby LEGOLAND Discovery Center. The Boston Ballet is a nonprofit, which Leckie said can be easy to forget. All of the proceeds from the pop-up shop go directly to supporting the organization and its production of “The Nutcracker,” which will run through Dec. 31 at the Boston Opera House.